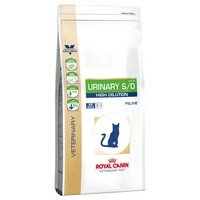 Royal Canin Urinary S/O High Dilution Dry Food for Cats is a carefully balanced vet diet to help keep urinary infections under control, to help treat kidney stones and to relieve bladder problems. Designed to balance the pH levels and dilute the alkali properties in your cat’s urine, Royal Canin Urinary Veterinary Diet will help with the dissolution of struvite uroliths and reduce the risk of recurrent struvite and calcium oxalate urolithiasis. This works, have had no recurrence of the problem since the cats started with Royal Feline High Dilution UHD34. The cats appear to enjoy it more than all there other food, they must have some of it with all there meals. The one problem is an issue of the cats putting on weight, if not for this would give it 5 stars.